Board strategic readiness means a board knows and meets its responsibilities for strategic planning and ongoing strategic thinking. Here’s how: a checklist of 10 questions from my new book Strategic Planning Guidebook. How does the board regularly pay attention to the changing strategic landscape and engage in ongoing strategic thinking? What is, and how do you evaluate and improve, the board’s role in your organization’s periodic and ongoing strategic planning? How do you ensure that every board member is familiar with your strategic plan? How does your current strategic plan figure in or guide the board’s work? What is the board’s role in ensuring your organization’s financial sustainability, including fundraising and development that are needed to achieve strategic plan goals? How does the board regularly and formally evaluate its composition, structure, and practices—and continuously improve? 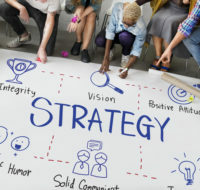 What does each successive strategic plan suggest about board composition, for example, the kinds of expertise and stakeholder representation the board needs? How do you ensure diversity and inclusion that will contribute to strategic thinking? How are board committees organized to align with strategic plan goals? When and how does the board plan an annual calendar, and how do you ensure that strategic discussions happen throughout the year? Naturally, board strategic readiness implies that you continue to learn and improve by asking the questions over and over. Sometimes you’ll need some help. In my book, I talk about how to decide when to hire an outside consultant, and when you probably don’t need to. When you do need help with board building, think about bringing in a qualified team coach to help the board assess its readiness, have the rigorous discussions needed to make new decisions and plans, and adjust group norms and habits. A team coach works with the board during its meetings, using strengths-focused questions and real-time, on-the-spot feedback. When I am coaching a board, I invite a different board member at each meeting to pay attention to specific aspects of the board’s process. This is one way to help boards learn to self-monitor and continuously learn.